A friend of mine asked me to help him break into the fashion/marketing industry as a stylist and merchandiser by developing a personal identity for him. I decided that I could provide him a brand that would maybe give him an edge while looking for clients. I took what I know about Derek and I worked with him to figure out how to effectively brand such a fabulous character in a way that is pushing the envelope but still subtle and timeless. Create a personal brand for Derek Groves, a budding stylist. Apply the brand to various assets that would allow Derek to break out onto the scene. The brand guideline should afford easy application to various mediums and scenarios. How can I incorporate Derek's fashion sense and taste into a brand and keep it simple enough that he doesn't need to consult me for future applications? I needed to understand what the brand of successful stylists looked like and how it's applied. I also wanted to see if stylists marketed themselves the same way that designers do or if they do it differently. I noticed that many high-profile celebrity stylists barely have a website. Most of their clients come word-of-mouth or through a management service. That told me that I should not focus on online assets, but rather I should just give Derek something that he can use to get started that makes him special until he is able to pay for agents and managers to get him jobs. I also noticed that most stylists that do have an online presence tend to be somewhat bland. Mostly white websites with black menus and one or two accent colors juxtaposed with white women in wide-brimmed hats. I knew that this wasn’t Derek’s clientele, so I wanted to make something that really gave him an edge and told people that he is not your run-of-the-mill, skirt and blouse stylist. Insight after research: I realized that most stylists aren't really branded in the same way that I'm branding Derek, so I didn't need to base my choices around an existing structure. However, this meant that my brand should be open-ended enough that Derek can apply it anywhere, whether that be a book-cover or an instagram photo. The first thing I did with Derek was set up some moodboards based on my perception of him as a person and the way that he dresses and presents himself. I wanted to give him three different directions and see what he liked from each one so that I could set myself up for success as far as giving my client something that they want as well as something that fits in with how other people perceive them. However, Derek immediately started talking about things he liked from all three directions. I decided to have him circle things that he liked from each direction and I would use that as the basis for building his brand. 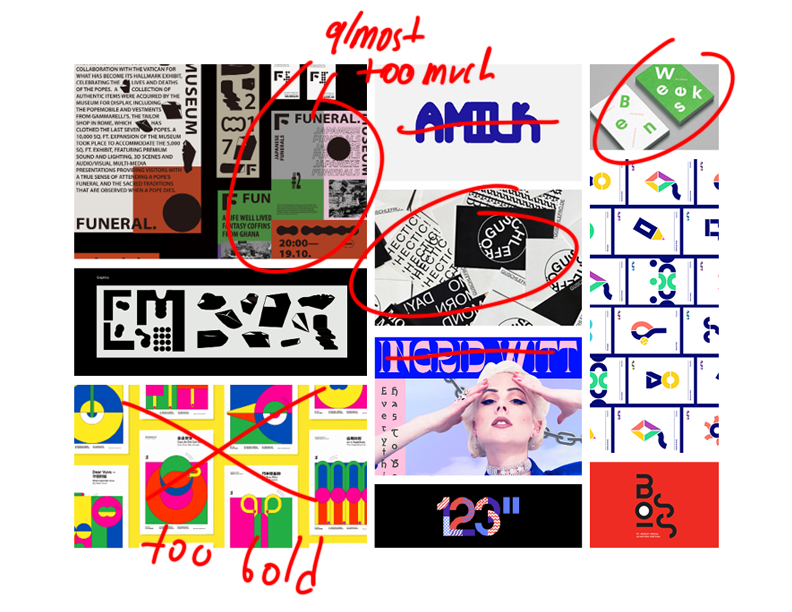 After looking through the initial mood boards, I made another one that focused more on color and type. Since this brand is something that is going to represent Derek as an individual, I did not want to make any big decisions without his input. I took the same approach to this second board and had Derek write on it with red pen. 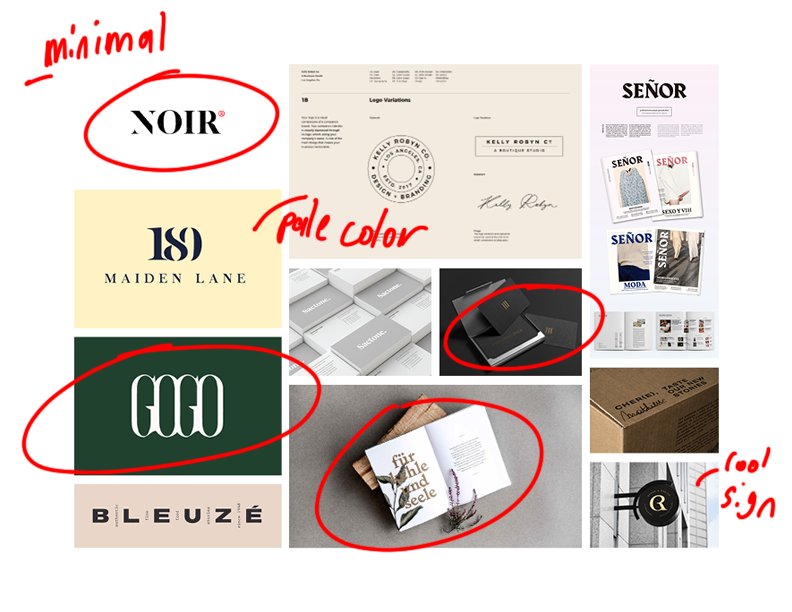 I had the original mood boards out as well and asked Derek some clarifying questions. We made a list together of guidelines for me to follow for when I started designing. I feel like I had a clear idea of where I wanted to go from there. My goal for the design is to walk the line, visually, between edgy/young and upscale, timeless fashion. I want the design to look interesting, but refined. The main elements should be physical and should help Derek begin to get hired places. Derek is kind and bubbly, but also mysterious and I want to emulate that combination of traits through this design. I also want the design to be easy for Derek to tweak himself. Even though I’m the designer, I want Derek to be in charge of his own brand. I want this design to be more like a system that Derek can apply to whatever he wants without my help. The untreated wordmark is simple and straightforward. Derek told me initially that he was hesitant about having a logo because he felt like they are often arbitrary. My research showed that a lot of stylists don’t really have logos either. I wanted the wordmark to be bold and I chose the typeface Friedrichshain Regular as the face for the mark due to its versatility and the condensed look to it. Keeping my goal of versatility and designing a system in mind, I chose a typeface that looks interesting, yet legible when stretched. Derek was interested in distorted type and I think that a simple way to make his wordmark unique is to treat it in a way that turns his name into an texture or a graphic element. The treated wordmark will take the shape of whatever container it is in — that may be a business card, signage, etc. I made this choice because ultimately, this was a short project for a friend of mine who just getting started in styling/merchandizing. I wanted the wordmark to be flexible and easily applied to anything without too much fuss. I looked through Derek’s closet as well as consulted him about his favorite colors and I picked out a suite of brand colors. I wanted to contrast from the black and white, styling websites and have color be a large piece of the brand. I gave him the codes for the colors, but I wanted to allow Derek to experiment and the brand guide specifies that strict adherence to the color codes is unnecessary, but keeping the colors in the same family is suggested along with a collection of suggested combinations. The two typefaces I chose are Friedrichshain Regular and Helvetica Neue. Friedrichshain is the same typeface as the wordmark and looks great as headings and titles. Helvetica is the body type and is a classic font that Derek asked for specifically. This whole project started because Derek needed help making a resume, so I figured that would be the prefect primary application. However, I wanted to go beyond a simple resume and created an info-suite that Derek would leave at the front desks of potential client's offices and storefronts. The suite contains a resume, cover letter half-sheet, business cards, and a look-book that would contain information and pictures of Derek's latest ventures. Secondary applications could be anything from storefront signage to personalized rubber stamps. The wordmark is versatile enough that it could be applied to almost anything that Derek would need. This purpose of this project was to help out my friend trying to get started in fashion. I wanted it to be tasteful, refined, versatile, and forward-thinking because that's who Derek Groves is and someone's personal brand should be a reflection of who they are. I was successful in bringing out Derek's unique sensibilities through the color choice and through having him directly involved in the research process. I also felt that I was able to create a brand guide that Derek will be able to use, without my help, to start building his style empire.